Cross-posted from streets.mn Not dead but buried. Why did London go underground? It didn’t want its core (The City of London) sliced up with railways going hither and yon. It was not an unconsidered decision, the whole process of first ensuring lines did not cut through the City established early on (the first Railway to London was 1838), the Report on Termini recommending the Underground in 1856, with opening in 1863. While many US cities, including St. Paul, managed to build Union Stations, London was practically circumnavigated by about 17 major surface railway stations terminating lines to the rest of England. The Metropolitan Line was built to connect the northern slew of them, from Paddington through Marylebone, Euston, St. Pancras, King’s Cross to Farringdon. It was built underground of course, so as preserve surface level connectivity, in the case of London, mostly existing local streets. They used cut-and-cover construction. It was a phenomenal success (and profitable! ), and was quickly replicated throughout London. Other cities eventually caught on. Today Asian cities are outbuilding them all. Unfortunately, Greater MSP learned nothing from history and did not go underground in the core cities, and we see the result today, downtowns disconnected from the rest of the region by highways. People close enough to walk to the core who cannot. The idea of underground highways is not new. In 1940, Robert Heinlein penned The Roads Must Roll. We have had tunnels underground as well as under water. 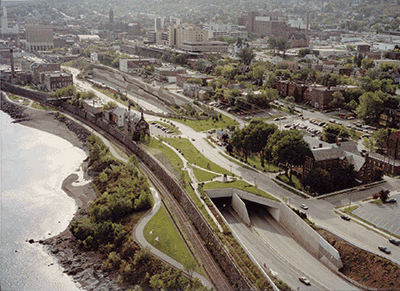 Even the Twin Cities has a land tunnel under the Lowry Hill to preserve the neighborhood above. Unfortunately the Big Dig has given such roads a bad name. Fortunately the Twin Cities does not require any more digging, we just require bridging, many miles of Twin Cities roadways are built in trenches begging to be capped. There are many examples nationally todraw from. The experience of Air Rights in Minnesota is not vast, but it does exist. In Duluth there is a park built above a Freeway. An advantage of parks is that they do not require Benefit/Cost Analysis, unlike some other investments. In Minneapolis, we have both parking ramps and the Twins Stadium built atop I-394. Part of the University of Minnesota crosses what used to be the Washington Avenue Freeway Trench. But we can of course do so much more. When I was teaching Networks and Places a few years ago, we often selected as group projects the design of an Air Rights/Land Bridge project across a Twin Cities freeway section. The whole exercise was written up here from a pedagogical perspective. The specific ideas generated (linked below) varied from plausible to implausible. The general concept remains valid, freeways in Greater MSP dismember the urban fabric, and we need to sew patches to restore the structural integrity of the transportation mesh. Think about I-94 between St. Paul and Minneapolis. Most of it is entrenched. Much of it could be bridged creating viable land uses. This is not cheap, and surface parking indicates land is not yet sufficiently scarce we need to create more of it, but it is about more than just creating developable properties or parking ramps, it is also about accessibility, walkability, and a city worth living in. We could think about the best sites to do this on. I would start with roads crossing the freeways without exits to the freeways. The reason is the simplification of traffic movements, and reduced costs, as well as more success as sidewalk facing land use. We could also think about which land uses to enable. Parks are always popular. Retail in retail districts is as well. Parking ramps over freeway Bus Rapid Transit (the Orange and Red lines) may be appropriate. If buildings they may simply front on streets, or they might cover entire blocks, especially if parks. There are costs the larger they are, with ventilation and other mechanical systems to be considered, as well as structural systems and construction complications. Of the identified sites, I would vote for Nicollet 1st and Chicago 2nd, Hamline 3rd, Cedar 4th, Franklin (I-35W) 5th based on market potential and ability to better connect communities. Did I miss any? What others should there be? Your job: make the case for the best potential Minnesota freeway cap, what it should be, and why in the comments.